In this week’s economic update, we take a look at the positive signals coming out of Japan, particularly relating to inflation, and the possible impact these could have on their economy. Following this, we take a step back from Brexit and instead focus on what’s happening elsewhere in Europe, before finally looking at Trump’s most recent tweet and splitting fact from fiction. 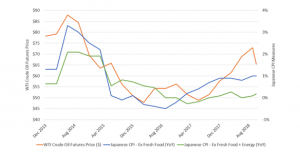 During his second stint in power, Japan’s Prime Minister Shinzo Abe was faced with what appeared to be an intractable deflationary problem. At the time, December 2012, inflation in Japan was negative, -0.1%. But why is low inflation or deflation a problem? Surely it is good for consumers? Well at surface level it seems ok but dig deeper and it has serious negative implications. For example, falling food prices mean people have more money to spend on non-essentials, which boosts the economy. But, why buy non-discretionary items now when they will be cheaper to buy next year? The problem here, it is thought, is behavioural in nature. What economists observe in a low or falling inflation economy is a predisposition to defer spending. This also encourages savers to hold cash but chase assets that provide a better yield (income) in real terms. A lack of spending and high cash savings levels impedes domestic consumption which feeds back into the economy in a variety of ways; lack of demand, stagnant wage growth and yes, lower prices. Breaking this impasse has been extremely challenging given the demographics of an ageing population whereby older people (generally) have less earning capacity and lower spending power. October’s inflation (CPI) readings, which exclude fresh food prices due to their volatility, show inflation pointing up. It was steady at 1.0% for October, the same as September’s figure, and from the chart of prices historically, we can see CPI is no longer negative. However, the fear for those at the Bank of Japan (BoJ) is whether a higher positive rate can be achieved and sustained. The fall in oil prices during October and increasing pressure on the country’s telecoms providers to reduce mobile phone charges will feed into the inflation series making the headline rate lower. The way oil prices impact on the CPI measure can be seen below. As oil rises in price so does inflation and vice versa. What economists tend to focus on however is underlying ‘core’ inflation, excluding larger variables like oil that have a disproportionate effect. After doing this we can see that underlying price growth is stubbornly low. The BoJ’s current inflation target is 2% and is the bank’s primary policy target. To help reach this target, Abe launched his economic policy strategy, known as Abenomics when he was elected. Made up of three ‘arrows’ the policy is built from three key components; monetary policy, fiscal policy and growth strategy/ structural reform. More recently we have seen a more hawkish tone from Haruhiko Kuroda (BoJ governor) towards the BoJ’s current monetary policy as the governor looks ready to try and raise interest rates. He is also indicating that the BoJ’s zero interest rate policy (ZIRP) may be contributing to the problem. It locks their banks into a cycle of low profitability. In the background the BoJ are wary of dispersion of monetary policies globally. They are concerned about being cut adrift and being out of line with other major central banks as they pull back from QE and begin raising rates. With expected pressures to come from slowing global growth, worries about trade wars and the intention to raise consumption tax (like VAT), it is likely that the BoJ’s bond purchasing programme is here to stay for the time being. Tactically, they are slowing this down; whenever the 10-year bond yield shows signs of picking up they pull back. There is also talk of increasing fiscal spending to offset the negative effect of the consumption tax increase being imposed next year. In conclusion, Abenomics has been criticised as having been ineffective because the inflation target hasn’t been reached. However, the scale of the challenge faced by Japan has been enormous and avoiding deflation, as they are doing now, is something to be cheered. 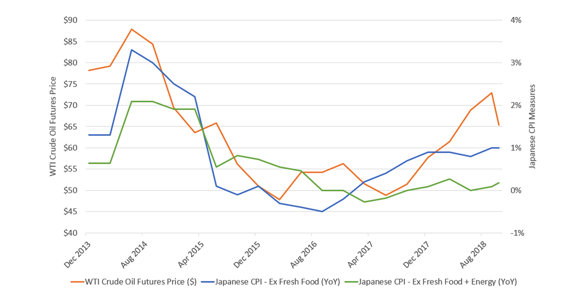 We have written previously about signs of rising wage inflation and as we move forward into 2019 this is a subject we will revisit along with the wider aspect of general price levels across Japan. Over the past several weeks we have been bombarded with updates on Brexit negotiations between the UK and EU. However, as one book closes for Europe, another one opens. The big issue, and one that is comparatively undocumented by the mainstream media, is what is happening politically and economically in Italy. In June of this year a new coalition government comprising two populist parties formed to govern Italy. They entered the political amphitheatre with two key goals in mind; the rejection of EU austerity and renegotiation of Italy’s debt. As of 2017 Italy’s debt to GDP ratio was the second highest of all the EU members at 131.8% (for every £1.00 produced from goods and services in the economy the government owes £1.31). Contributing to indebtedness is the government’s annual budget deficit which last year was running at -2.3%. Under EU regulations, members with a Debt to GDP ratio greater than 60% must reduce their annual budget as a means of reducing the debt ratio. However, friction between the European Central Bank (ECB) and Italy is growing because their proposed budget is -2.4%, surpassing the previous deficit and thus adding to their debt pile. Why is the ECB involved? Simply put, a 131.8% Debt to GDP ratio is not sustainable. Italy, like all other EU members, has no sovereign currency nor control over its monetary policies, and as such it is unable to print money in the same way that the UK could. Instead the ECB assists Italy by buying Italian government bonds. This helps ensure that interest rates in Italy and on Italian bonds are lower than they might otherwise be if the ECB was not effectively underwriting the debt. Without the ECB acting as the “buyer of last resort” international buyers might be more inclined to sell which would push yields up. This aspect matters a great deal because Italian banks, already struggling with bad loans, own lots of Italian government debt. If bond yields rise precipitously it will create losses making the banking sector even more fragile. The main issue now is that the ECB is keen to ease back on its crisis era quantitative easing policies and this include scaling back their bond buying programmes. This process has already begun, and a further announcement is expected in December. If, as planned, the ECB stops its bond buying programme at the end of the year, this in-turn would leave Italian debt subject to market forces. With an economy that is sluggish and a controversial coalition government intent on spending significantly more than the country is recouping from taxes, problems seem likely to arise. Italy is not alone in economic and financial woes. Economists and ECB officials have been on edge regarding Italy’s future spending but there are other countries also challenging European fiscal rules. Recently France, Spain and Portugal have all been cautioned by the ECB on their failure to reduce their respective 2019 budget deficits by what was previously forecast. Most surprisingly, economic growth in Germany, Europe’s largest economy, contracted for the first time in more than three years, shrinking by 0.2 per cent between the second and third quarters on the back of a fall in exports. The amalgam of these factors led to disappointing growth figures for the eurozone, as a whole, in the third quarter. The eurozone’s economy expanded by just 0.2 per cent, down from 0.4 per cent in the second quarter — the smallest expansion in more than four years. Italy’s economy did not grow at all. How could all this impact Italy? Germany, Italy, France and Spain are the four largest economies within Europe, excluding the UK. As such they have a significant influence over the EU. Historically, Germany has advocated conservative monetary policies. However, Angela Merkel has recently announced that she is to step down as German Chancellor and her possible successor, Friedrich Merz, has very contrarian views and is regarded as being economically liberal. His candidacy has prompted speculation of a more relaxed approach to fiscal spending rules as a way of spurring economic growth across the bloc. Ultimately, the ‘power-houses’ of Europe could push for discussions with the ECB surrounding a continuation of loose monetary policies, such as quantitative easing. Whether this extends to renegotiation of legislation relaxing the rules on sovereign budget proposals is yet to be determined. Italy’s debt situation is what is most problematic for Europe. The EU wants to avoid a repeat of the Greek crisis and yet worries that not sticking to their own rules opens the door to further compromises with a populist Italian government that may push their patience to the limit. Expect sensational ‘debt laden Italian banking sector’ headlines to come your way soon. Some of you may recall an article we wrote on the 29th of September called ‘Oil Taps’. In our ‘beyond the headlines’ weekly we set out to explain factors influencing the oil price. We highlighted initiatives underway by OPEC to stimulate supply as well as pointing out that Russia was stepping up their production to optimise revenue: In other words, co-ordinated efforts that could restrain price rises and possibly drive prices down. Despite the initiatives by producers, undertaken in June, the oil price continued to rise, going above $80 per barrel. This spurt was, we think, due in large part to sanctions on Iran being discussed by the US. It now seems that speculators, eyeing possible supply interruption, pushed prices higher than warranted by fundamentals. The following tweet appeared on Wednesday evening, two months down the line. We didn’t get all his words right, but we were close! Incidentally, the lower price of $54 he quotes is for West Texas Intermediate (WTI) and the higher price of $82 is Brent Crude. This creates the maximum price difference but it is not comparing apples to apples. To be accurate and correct he should use the same series for the higher and lower prices; WTI’s highest comparable price is $76 and Brent Crude’s lowest comparable price is $62. Fake news anyone?